When I think of autumn migrations, it’s the Whooper Swans, Fieldfares and geese that first come to mind. Or I might think of the birds that leave us in the autumn – the Swallows, Arctic Terns and warblers that have been here for the summer. The distances many of these birds fly is astounding, from the Arctic Terns crossing from one polar region to the other, to the many species that travel between northern Europe and sub-Saharan Africa. If these migrating birds make us marvel, then what about the even more fragile creatures that cross to our shores through the summer and autumn? I mean the butterflies and moths, of course. It’s hard to believe that these insects with their delicate wings make it here intact across the sea, buffeted by winds and yet flying strongly. And make it they do. The Monarchs of North America are perhaps the most famous migratory Lepidoptera, but they are far from alone in their travelling habit. Here in Cornwall, we are still getting new arrivals. Some are regular migrants, like the Hummingbird Hawkmoth (Macroglossum stellatarum) or Clouded Yellow (Colias croceus) butterfly, while others are more exotic and rare, blown across on prevailing winds. We’ve even had a handful of sightings of Monarchs in Cornwall over the last few weeks, carried here across the Atlantic. Also visiting Cornwall and the Isles of Scilly in the last few days was a rare immigrant – the rather exquisitely named Slender Burnished Brass moth (Thysanoplusia orichacea). A native of the warmer Mediterranean and Africa, there are only about 100 records ever for Britain (and now five more this year in Cornwall! ), where it cannot survive the cold winters. I also learned from the press release that Cornwall has received some less welcome moth visitors this year. The Box Tree Moth (Cydalima perspectalis) is an Asian moth, introduced to Europe over the last decade. The moth itself is rather lovely, with white, almost transparent wings. It’s the caterpillars that are the problem, with their ability to rapidly defoliate the Box shrubs (Buxus ssp.) beloved of topiary and ornamental gardens. The first British records of this moth were made five years ago, and this year there are two records in Cornwall. Oh dear. But let’s console ourselves by remembering that, in our mild-to-date autumn weather, everyone is still reporting sightings of our regular migrant butterflies – Red Admirals (Vanessa atalanta), Clouded Yellows and Painted Ladies (Vanessa cardui). It’s already turning colder, so let’s enjoy them before we finally have to wrap up warmer for the winter. If you want to find out more about butterflies and moths, and/or migrant species in particular, here are some useful websites. Atropos, the journal for butterfly, moth and dragonfly enthusiasts. This website has information about new arrivals, how to get involved in recording and sharing information. Butterfly Conservation. This national charity’s website has information about butterflies and day-flying moths, how you can help, including recording, and news on their research and conservation projects. Cornwall Butterfly Conservation. The local branch of the national charity. If you live in Cornwall, you might like to go along to their annual AGM and members’ day on 7th March 2015, when Paul Waring, a nationally renowned moth expert, will be giving a talk. Details are on their website. UK Moths. A great website with lots of good photos to help in identification. Author Amanda ScottPosted on November 3, 2014 Categories East Cornwall, Mid Cornwall, West Cornwall, What's wild in CornwallTags Butterflies, Cornwall, migrating insects, mothsLeave a comment on What’s been flying in? Friday just gone was a day of Small Tortoiseshells. 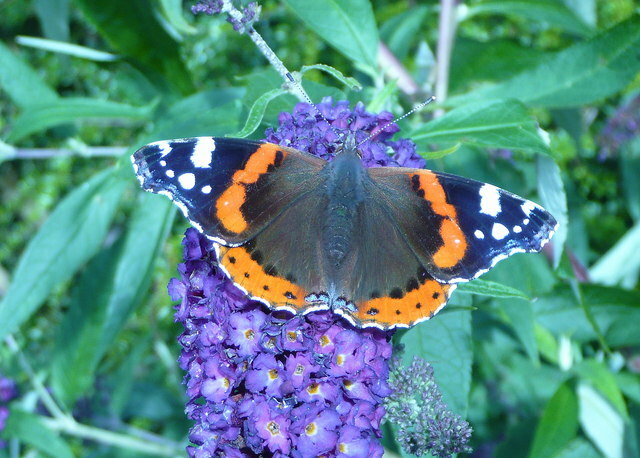 My garden in West Cornwall was visited by tens of them enjoying a late summer feast on the buddleia – I was glad I hadn’t pruned it back already. But then Saturday and today, Sunday, there was barely a Small Tortoiseshell in sight. Instead the garden was full of the striking beauty of several Red Admirals, again nectaring on the buddleia, but also seeking out ivy flowers and late summer bramble. Butterflies seem so delicate, it is easy to forget that several species accomplish great feats of migration. The strong-flying Red Admiral (Vanessa atalanta) may have a small resident population in the south of the UK, but most of those we see each year have arrived from Europe and North Africa. The females lay eggs (usually on common nettle (Urtica dioica)) and UK-bred butterflies emerge from about July, but their numbers are swelled by several further waves of immigration during the summer. You can see them as late as October, occasionally later. Our winters are generally too cold for this species to survive overwintering, possibly apart from the warmer south of the country (including Cornwall). Many adults will therefore attempt a southward migration as the weather cools. On a wildlife boat cruise out of Falmouth recently, while I was of course thrilled by the sunfish and porpoises, I was also delighted to see two Red Admirals a fair way out from shore, determinedly heading south away from the coast. I hope they made it. I have a lovely butterfly book, inherited from my parents, dating back to 1968. The colour illustrations are detailed and painstakingly drawn; the text simple and hopeful. Why hopeful? I think because the words the author uses pre-date some of the more recent significant changes we have seen in our landscape, particularly those affecting wildlife, and there is very little about habitat deterioration or reducing species numbers. The book makes you feel that, at the right time of year and in the right place, you could walk out the door on a sunny day and see every single butterfly species you might expect to see. Turn instead to Butterfly Conservation’s most recent report on The State of the UK’s Butterflies (2011), and the picture is of course very different. Numbers of butterflies are reducing, with 75% of species showing a trend of a ten-year decrease, either in population numbers or distribution, with declining habitats suggested as a main cause. It’s a depressing picture, especially if butterflies have always been for you, like me, a joyful sight from spring through to autumn. Being very sensitive to environmental change, the problems we see in butterfly numbers are an indicator of all the wider issues adversely impacting our wildlife. So, in the face of this, it is heartwarming and encouraging, and hopeful, when a species starts to make a comeback. And this time, it’s a Cornwall success story. The White-letter Hairstreak (Satyrium w-album) has not been seen this side of the Tamar for over 20 years, but it’s back! It even made the local news. The great news was announced at the Annual General Meeting of the Cornwall Branch of Butterfly Conservation (BC) last weekend (16th March). Cornwall BC had been looking into a re-introduction of the species, working together with national BC and two White-letter Hairstreak experts, Liz Goodyear and Andrew Middleton, who came down to Cornwall in February to do a survey for the butterfly (or rather, for its eggs) – a pre-requisite for a re-introduction scheme. And, hey presto, they found eggs! Just three, at two different sites in south-east Cornwall, but firm evidence the butterfly is here, and breeding. How did it get here? There are some colonies across the Tamar in Devon, so they may possibly have arrived from there. Or it is not impossible that they have been clinging on in Cornwall, in very small numbers, but unfound, even though experts have been looking over the years – this is a fairly cryptic species. As well as suffering from some of the same issues as other butterfly species, the White-letter Hairstreak has had one specific, but very major, problem. 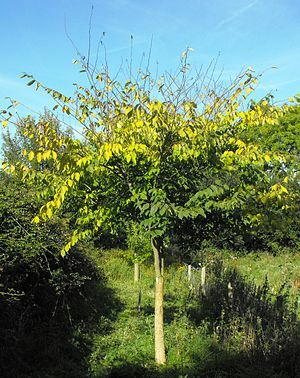 The one and only food plant of its caterpillars is elm trees and, of course, elm trees in the UK suffered devastation in the 1960s and 1970s from the beetle-carried Dutch Elm disease. And that meant all the species associated with elms, like the White-letters, also suffered badly. Not only did they reduce in numbers along with the elms, but White-letter Hairstreaks are a small butterfly, with a wingspan of about 3.5 cm, they are mainly brown (although their underwing patterning is lovely up close, with orange edges and the white banding that gives them their name), and they live mainly, and often in small colonies, in the tops of their host trees. This is why they are spectacular not so much for their looks as for being difficult to find. The adults are flying from the end of June through to August, feeding on honeydew in the tops of the elms. The best chance (still not good) of seeing their pretty pirouetting flight from the ground is early in the day or in late afternoon when they sometimes come down to nectar on flowers, in particular their favourite privet and bramble. My 1968 book suggests standing under a host elm and looking up, to catch sight of the fully-grown caterpillars silhouetted against the leaves – definitely written when they were more numerous! 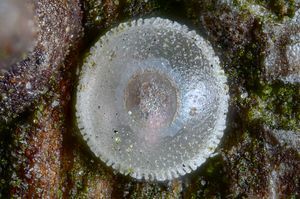 The eggs are laid singly, usually at the scar marking the join between old and new growth of the twig. They look a bit like flying saucers, and you’d have to be an expert to spot them with the naked eye. The caterpillars emerge between late-March and June, a timing that coincides with the emergence of the elm flowerbuds on which they feed before moving to the leaves. They pupate, attached by a single silk girdle, between May and July, and adults can be seen from June. Nationally, there is some evidence that White-letter Hairstreaks have been increasing, though it is difficult to separate actual increase from increased recording effort [UPDATE 26/3/2013 – see note at end of this post]. They remain nonetheless a priority species under the UK’s Biodiversity Action Plan, and this is why it is so special to find them back here in Cornwall. Here’s hoping they go on to make a good recovery. Cornwall Butterfly Conservation members will be surveying elms for White-letters later in the summer. If you’d like to help with the search, contact them via their website here – they’d love to have as many people involved in this exciting project as possible. UPDATE: The day after I published this post, Butterfly Conservation released (on 26/3/2013) the 2012 figures – see this link to the report in the Guardian. After the terrible summer we had last year, butterflies have fared extremely badly, including White-letter Hairstreaks which are now down by some 70%. This is a sobering thought after its rediscovery in Cornwall, and bad news for all our butterflies. Let’s hope for a better summer this year. And see the Cornwall Butterfly Conservation page (link below) for advice on how you can help butterflies. Butterfly Conservation 2011. The State of the UK’s Butterflies, 2011. Butterfly Conservation, Lulworth, Dorset. Mansell E, Newman LH 1968. The Complete British Butterflies in Colour. Ebury Press, London.